As the hypnotic draw of technology lures the masses into an ever plugged-in existence, a need for analog experiences and environmental stimulation drives us to engage the senses of sight, sound, smell and touch in our homes. This new direction in design is raising the bar to create interiors that are appealing to a design-savvy, yet sensory-deprived society. Our 2016 Trends address the importance of color in constructing stimulating environments. You’ll see how you can use varying hues, intensity and lightness levels, patterns and textures to establish your own sensory-rich space. Though each theme uses a different style and color approach, the end result creates interiors with impact and dimensionality. Chromatic brights mingle with dark moody tones, glossy surfaces and layered textures in this exotic-Asian-style inspired dining room. Call it the era of the dinner party revival! More people are staying home to cook and entertain, so the dining room is experiencing a welcome comeback. Spaces that activate the senses with a playful interaction of color, texture and pattern is one way to ensure your guests will keep coming back for more. Dark colors create an illusion of depth by making the edges of a room disappear, while brilliant pops of tropical color envelop this room in adventurous style. 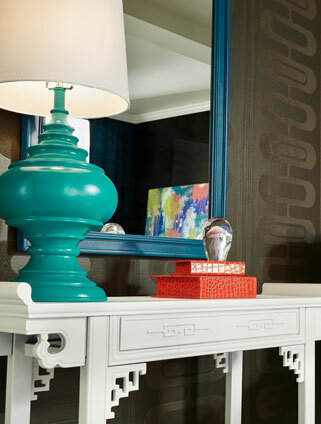 The traditional décor in a home office gets a stylish update with strong color, gold detailing and geometric patterns. 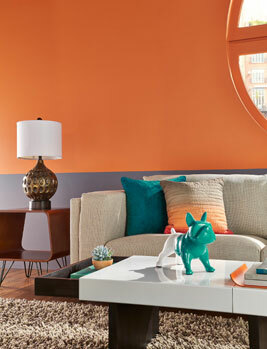 Horizontal borders of color at the top and bottom of a wall help a narrow room feel wider and more expansive. Eye-catching combinations are established through contrasting blends of bright and dark color, sleek lines and translucent surfaces. 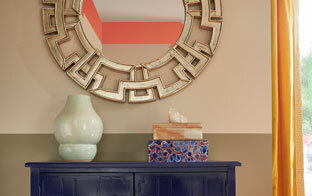 Neutral tones are enlivened with gold, coral and sapphire, resulting in a room that radiates confidence. 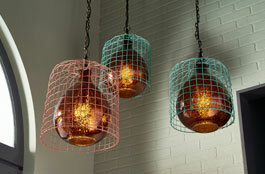 When it comes to modern style, everything is getting softer and rounder. 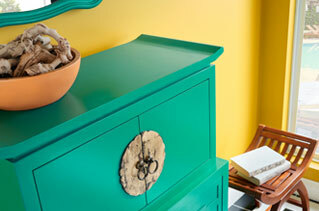 Look for organic furniture shapes, subtle color combinations and natural materials that envelope in quiet serenity. Natural greens and blues create a relaxed setting for a bedroom loft space. 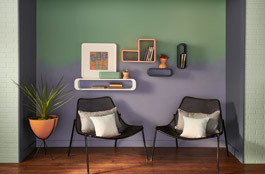 An ombre alcove is reminiscent of a misty, atmospheric landscape, balanced by black side chairs and abstract artwork. Orange and turquoise are pop accents that reveal a sense of optimism, while a mix of geometric patterns and soft textiles invite you into the room.